countries, as well as other states right here in the US, that I want to see. Unfortunately, I am also a very broke college graduate with rent to pay and a wedding to plan. I don't exactly have an abundance of time or money. Luckily I do have an escape, BOOKS. I can take a road trip cross country, learning about new landmarks along with the characters, and revisiting ones that I've been to before. I can travel to different countries that I've dreamed of visiting for well... ever. I especially like the books that have me sitting with my phone or laptop next to me so that I can google places and facts to learn more. I can know random details, or fun stories of traditions and culture without ever having been there. Sadly the "without ever having been there", is the kicker. Traveling via book is fantastic, but sometimes it only serves to make me want to jump on the next plane to a new country. I just get in my car and start driving. So you tell me. Am I just the weird one here? Or are there others like me? Please comment below! Where do you want to go? What are your favorite travel books?? Can't wait to see your replies! I would love to be able to travel more as well, but it's just not something we can do at the moment with my husband's job and Master's programs. I do love that I'm able to see new places through books, though. I do spend a lot of time googling things as well as I read (I also like to do this when watching television). I definitely know how you feel about all of this! I love reading books about places I haven't visited. I'm doing a book trip on my blog where I pick a book to go to next every week. Reading often makes me want to pack my bag and go somewhere immediately. Great post! I love travelogues and travel memoirs. I'd love to travel more but it just gets harder the older you get (more stuff ties you down and all). So I travel via books. I loved THE LOST GIRLS (four friends travel the world) and AROUND THE WORLD IN 80 DATES as well as anything by Bill Bryson. 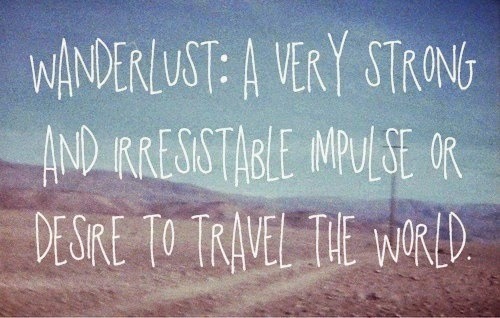 Wanderlust!! .... I love to travel, I've been lucky lately...I'm travelling a lot! I save money all the time to travel hehe. What books about travel can you recommend me? Have you tried Paul Theroux? The Happy Isles of Oceania is amazing. And anything by Bruce Chatwin. I'm very similar, and if you haven't already read it, Wanderlust by Elisabeth Eaves really validated my feelings on the subject! My bucket list includes Puerto Rico, Greece and Italy. As for books, I loved Under the Jewel Sky (India), At least youre in Tuscany (Italy), Snow Flower and the Secret Fan (China). Yes!! I just read John Steinbeck's "Travels With Charley" and it very much made me want to get in my car and goooo! Same when I read "Amy & Roger's Epic Detour".